Although people often associate workers' compensation claims with musculoskeletal injuries, broken bones, and falls, toxic chemicals in the workplace may present a significant problem for employees. Injuries arising from this exposure are often the result of inhalation through the lungs. In some cases, toxins cause damage after the lungs absorb them and they pass into the blood stream. Symptoms may include breathing difficulties, wheezing, coughing, headaches, vomiting, chest pains, fainting, and seizures. If you have been harmed by toxic chemical exposure at a job in the Boston area, an experienced workers' compensation lawyer at Pulgini & Norton may be able to help you seek benefits. Exposure to toxic chemicals occurs in many different jobs and industries, including hardware stores, gas stations, factories, manufacturing plants, and public transit. Toxic chemicals commonly used in workplaces include mercury, cadmium, lead, and asbestos. Lead poisoning is particularly common. While the most common victims of lead poisoning are children, lead can accumulate over a period of months in adults working in workplaces with exposure to this chemical, such as construction or a radiator repair shop. Mercury exposure, most commonly found in miners, can cause permanent damage to the nervous system. Cadmium is used in industrial workplaces, and acute exposure can be fatal. Asbestos exposure was once common in building and demolition, but it is less widespread now. It can take decades for symptoms of exposure to appear. People affected by toxic exposure outside the workplace can sue to recover their damages through a personal injury lawsuit. However, if you suffer an illness related to exposure at your job, your exclusive remedy is generally through the workers' compensation system. This provides no-fault insurance coverage for employees who are injured or become sick at work, and it is designed to replace lawsuits by workers against their employers. There may be exceptions when a person is hurt at work by a manufactured substance, such as asbestos. In that case, a worker may be able to sue the company that produced the substance in a civil suit, known as a third-party claim. 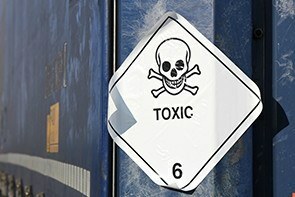 Since many toxic chemical injuries may be caused by long-term exposure and do not necessary show up in a single incident, some employers and their insurers are resistant to these types of workers' compensation claims. However, illnesses arising from exposure can be both serious and permanent, and a substantial amount of benefits may be available if an employee can properly document the harm that he or she suffered. Workers' compensation benefits available to people whose illnesses arose from toxic chemicals at work may include lost wages, medical expenses, and disability benefits. In some cases, an individual can receive a one-time payment for disfigurement or loss of vision after an injury. Surviving family members or dependents whose loved ones lose their lives due to chemical exposure on the job may seek death or survivor benefits. Before you talk to an insurer, it may be useful to discuss your situation with a work injury attorney if you have been exposed to toxic chemicals in Boston or elsewhere in Massachusetts. Many employers and insurers resist the idea of providing compensation for conditions arising from exposure, and you may need a forceful advocate to prepare you for conversations with insurers, an independent medical examination, or a hearing on your claim. At Pulgini & Norton, we represent workers and their families in Malden, Quincy, and Newton, among other communities. Call us at 781-843-2200 or contact us via our online form for a consultation.